Please post easily reported issues here directly. If your issue takes a bunch of screen space, please consider making your own thread and then linking to it here. I can no longer keep track of individual posts coming in… any help keeping this beta organized will be greatly appreciated. Last time, on 3.0.0.0, it just wouldn’t complete the download, this time the download completed but the file was quarantined at installation. changing the name from Target 1 to M33 in the sequencer still produces the exception. Is it possible to make a general point here ? glued to their respective boxes. Is there any change of Ver 3, at some point, having an option so these glued windows can be free floating instead and appearing in the center of the screen or near the bottom etc ?, I find this really annoying sometimes as the planner is quite a long box and when it opens about a third of it is off the right hand side of my screen. and then after about 10 seconds, just crashes. Tried running it multiple times. I did not try to uninstall v3.0.0.0 before installing v3.0.0.1. It depends on your intent I suppose. Do you want these options saved because you want to view all target graphs the same way or do you want to view each target a different way? and then after about 10 seconds, just crashes. No problem but just a couple of questions about installation. No doubt this has been covered before but I can’t find it. I’m a current user of v2.6.0.23. Does v3.0.0.1 require an uninstall of my current version, or is it a separate and stand-alone version? Can you clarify what you mean by your posted statement “…unless: You do not intend to purchase SGPro 3.0”. I simply don’t uderstand your intent. Thanks for your help and such a great software. I uninstalled v3.0.0.0 and tried to re-install v3.0.0.1 but had the same failure. An attempt to reinstall v3.0.0.0 also failed. So, I then attempted to re-install v2.6.0.20, the version I have been using since it came out. Installer failed the same way. So a recent update to Bitdefender 2018 is now seeing SGP as a possible virus and blocking its installation. I have not delved deeply into BD but will see what I can do to whitelist SGP or disable BD during the install. I tried to “white list” SGP in Bitdefender 2018 but for some reason that did not work. 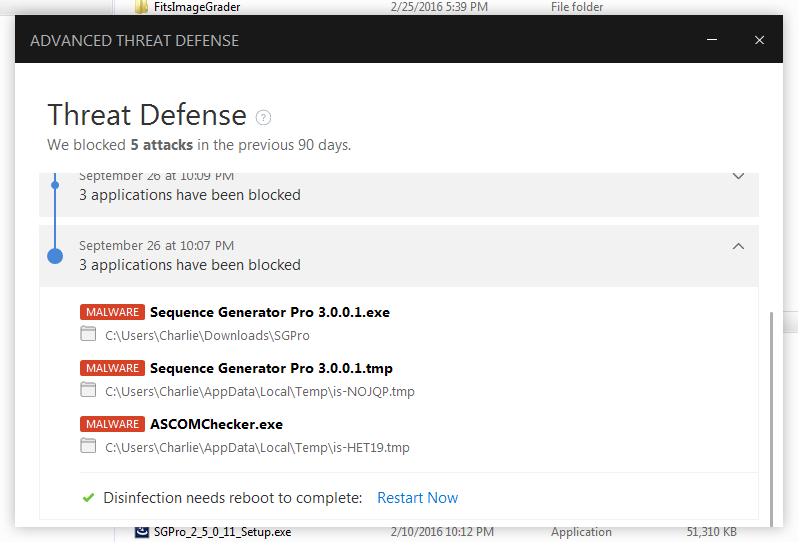 Turns out BD has an option called “Advanced Threat Defense” that can be turned off. Doing that allowed SGP v3.0.0.1 to be installed. After starting SGP 3.0.0.1, I opened the Target Settings dialog box and then just clicked the " i " icon to open the graphic - got an exception. After trying a couple of things, I realized I had not entered an RA or DEC value for the target. Entering a value solved the problem. Probably need to check for valid RA and DEC and put up an error box. Hmm, technically, 00:00:00 is valid for both RA and DEC but SGP threw an exception with those values. Right clicking graphic does not record end time if you click more than 3.5 hours past midnight. Some thoughts about extending the Planning Assistant concept – now that FMW is bundled, I would like to see the Target Settings dialog box support a Simbad database lookup on a target name just like FMW does. For new imagers, in particular, they often just want to take a picture of M51, for example. So being able to just enter M51 and click a lookup button to get its coordinates would be hugely helpful. If you actually want to do mosaics or to set your rotator angle or custom position your subs, etc. you would still use FMW. SGPro 3 will install over your 2.X version unless you change the install directory. If you install two different versions of SGPro they will share the same layout settings. Not sure how to clarify. If you do not intend to purchase SGPro 3.0, it is not in your best interest to install and test it. This might be an issue with the time of day you were running the checks (and SGPro’s interpretation of whether or not a particular time is considered today or tomorrow). Might try to see if that 3.5 hr window expands when doing the same test later. Anytime I right clicked in the graphic later than 3:30AM to select end time and altitude, the altitude was always shown as -90. Closer to midnight, the altitude was shown correctly. This was happening around 11AM. I just repeated the experiment at 11PM and right clicks and left clicks worked just fine. Also, I just downloaded 3.0.0.2 and Bitdefender 2018 blocked the installer. I will disable BD tomorrow and install 3.0.0.2. I have just downloaded v3.0.0.2 with no antivirus problems. During the install my antivirus, AVG, challenged the ‘ASCOMCHECKER.exe’ and I had to create an exception for the install to complete. 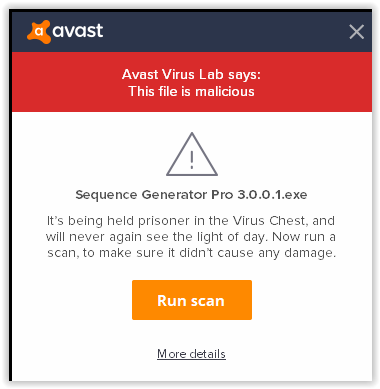 When I tried to start SGP, AVG antivirus wouldn’t let me, saying that the app might be dangerous and has started investigating the software and would get back to me. I turned off AVG and SGP started with no problem. I have now repeated the test of the start time / end time selection in the graphic and it clearly works properly when done at 11PM and fails when done at 11AM. I just tested at 10:30 AM and a left click picks the time and altitude correctly but does not display the green dot. Then right clicking the graphic at a point later than about 3:45 AM causes the end time to be correctly selected but the ending altitude is shown as -90. The red X is not displayed. In the graphic, I right clicked at 3:59 AM. I use Avast (Free edition) for AV protection on my W10 pc. I installed 3.0.0.2 beta today after disabling Avast. It installed all fine. After installation I re-enabled Avast and I have had no problem using SGP. Just installed V3.0.0.2 beta today. I don’t seem to get anything on the planning display. Is there something I need to enable in settings?